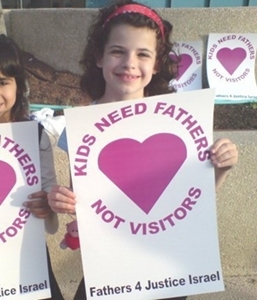 The new year starts very well for fathers rights in Israel. On January 19, Justice Minister Yakoov Neeman announced that article 25 of the Israel Capacity and Guardianship Law -the Tender Years Presumption Law- was gone. The law was automatically granting sole custody to the mother if the children were under 6, allowing mothers to alienate the kids at will and getting rid of the father from their life. The new Israeli law will now order joint custody even in cases of divorces involving young children. The Israelis did not go half way on the path to reforms. More scrutiny will be applied to the examination of charges of abuses brought against men and it seems that child support laws will be made fairer to fathers. The process that led to these sweeping changes is also quite interesting. Fathers rights organizations had the brillant idea to involve the United Nations. The United Nations Committee on Economic, Social and Cultural Rights urged the Israeli government to amend its laws so that were discriminating against fathers seeking partial or full custody. That is an example for fathers rights organizations to follow in the US, where the media and the politicians are totally deaf to the rights of divorced fathers to see and live with their children. I would like to comment on this….the Coalition for Families organisation wrote the paper, but NO ONE went to the UN to lobby the cause. It was myself and a colleague who went and used the paperwork. I went because I’ve tried for 5 years to free my Israeli husband from a No Exit order on exhorbitant child support demands ahead, and my colleague went as he has major battles to get access to his daughter in Israel. We lobbied the UN members and I challenged the Israel delegation to give me back my husband, and my life. When we arrived, the UN members had mountains of documents lobbying, but we used that particular document, and as I was female my colleague felt they would not consider the requests on freedom of speech/movement, suicide numbers etc to be biased just to men. My own husband sadly tried to commit suicide just a month after that visit and my human rights battle continues. Thanks for this important information. Let us hope that your husband will soon see his child support payments revised downward. Joel Leyden is a liar. There are many police reports and lawsuits documenting his many online crimes. He harasses and defames many good people, while he spreads false self-promotional material like this, about himself. The “Israel News Agency” is a fake “news agency” that is not officially linked to Israel or the Israeli government whatsoever. Leyden uses his fake “news agency” to publish false, defamatory, and harassing information about others, while he publishes self-promotional and fake information about himself. The fake “Israel News Agency” was removed from the Google News index, because of this. For more information about Leyden and his spam, scams, crimes, and fraud, I urge you to please checkout our website “Joel Leyden Watch” – you may want to seriously consider researching the claims in this post, as nothing from Joel Leyden or his fake “news agency” can be trusted. He is not a reliable or credible source. On our site, you may read the police reports and lawsuits against Leyden, who harasses many good people, including his ex girlfriends, and many Jews and Israel supporters whose efforts he is jealous of. Thank you for your attention in this important matter. From all I have seen, the UN is full of feminist bureaucrats, how do they help? I don’t fully believe that part of the story, and if it is true, it is well worth explaining in much more detail as it would exonerate some of the UN and it would give us a point of contact for bringing that out to bear on other places. It was the UNHRC – UN Human Rights Committee. I was there and I’m a female. Saying the UN is as you describe is not the same committee. The facts were raised on human beings – NOT just men – who are affected by family laws in Israel – children ie Tender Years, women – obvious, and men held by No Exit Orders for ‘extortionate ransoms’ as one committee member said to Israel’s delegation. You can read all about this in my book, Sour Milk & Stolen Honey, available on amazon.com and get the full story of what happened there.